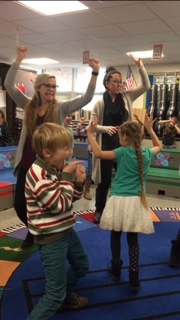 My teaching partner (Sarah) and I got to co-teach music for a day! charge and come in and check on them throughout the day. playing Name that Tune compliments of ITunes. no break, no bathroom, no coffee. Thank goodness there were 2 of us. to some of my favorites! I got to teach my first grade class which they thought was funny. impressed how they knew about the woodwinds and brass instruments. with them as most were our former students. and are in awe of our wonderful music teacher! I wonder where what our next assignment will be?